From the Corinna pub, across the river the road climbs steeply back into the rainforest. Given my dinner and beer intake I opted to walk the 1km of 18% in the hot evening sun. Once onto the double track out to the coast I was confident I had made the right decision to shorten the trip. The sunset was spectacular as a pedaled out onto the beach. What a day it had been, I caught the sunrise at Cradle mountain then made it all the way to the west coast for sunset! Shortly after sunset I was in my tent and fast asleep. I didn’t wake until just after sunrise the next morning. It was a very heavy sleep. 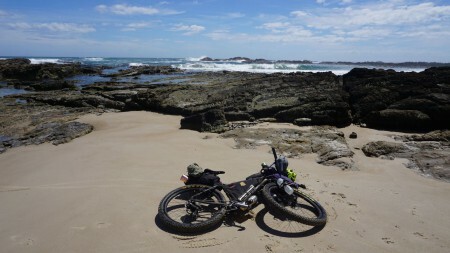 In the morning I decided to leave my tent set up and ride up to pieman heads unloaded and enjoy a bit of a rest day after the big push. I was really happy to find the beach was easy to navigate on the 29+ even the creek crossings were rideable. 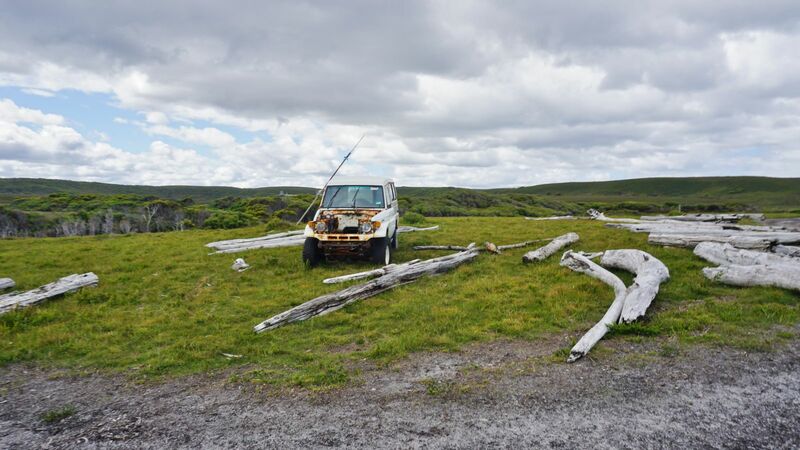 Once off the beach to the north the 4×4 track offered some challenges in the form of which wheel rut to pick but it was fast moving and really good fun! There were a few 4x4s and quad bikes about. 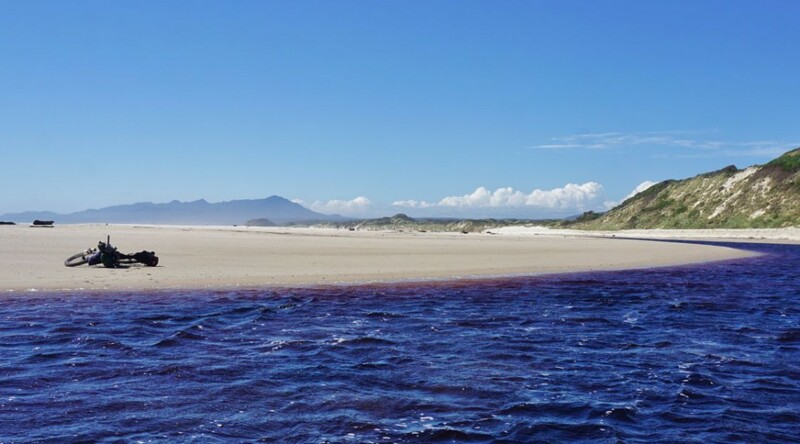 I had some lunch and a swim and headed back towards my camp 15km to the south. 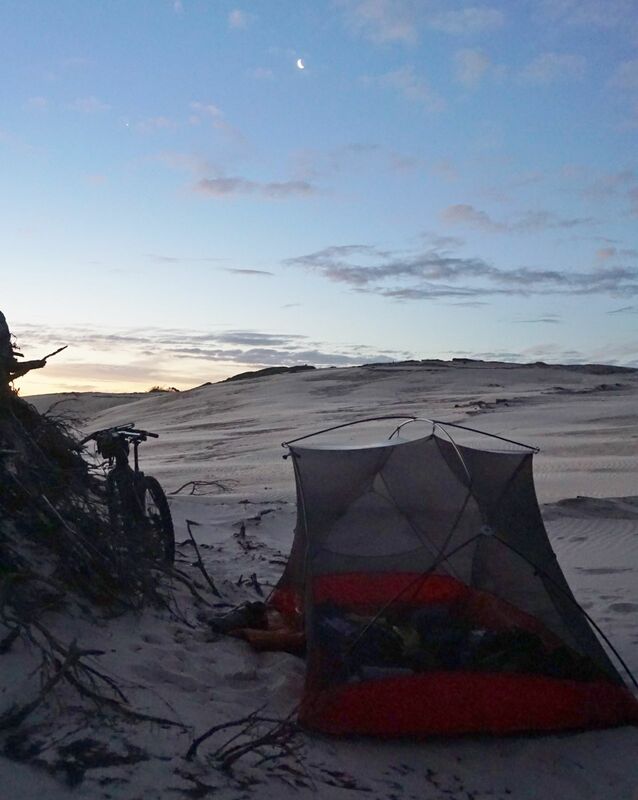 After packing up camp it was a long ride down the coast with the howling ocean on one side and the towering dunes on the other. 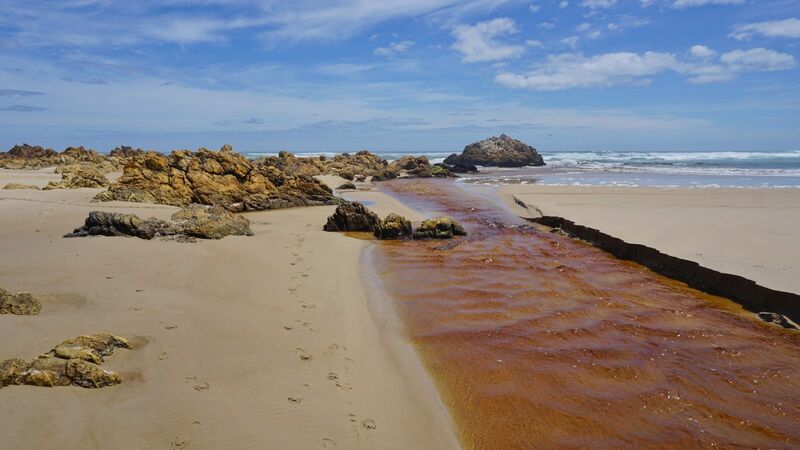 For the most part the ocean beach is hard packed with biggest obstacles being drifts of giant kelp washed ashore and the occasional stream to cross. Later in the afternoon the track headed inland onto some pretty sandy tracks, at times it was too much for the 3inch tyres and I found myself walking in the hot afternoon sun.